Just at this time I feel like my life is on hold. I am all set to hit the road but am waiting for some important bits and pieces to complete my home on wheels. It is as if the Gods who watch the soap opera of our lives in hysterics each night, especially at the bits where we pretend to be in charge of our own destiny, have clicked the pause button. As I wait for signage and other items to arrive I am enjoying reducing my possessions to fit into my Adventure Camper. The thought of having just one of everything is intoxicating. I'll know where everything is, possibly for the first time in my life. There will be no vacuuming, no ever reddening bills and reminders arriving in the mail and email. I had set my final departure date as the 23rd of May. I am not superstitious. I walk under ladders, put umbrellas up inside and dice with all kinds of omens. But if there's a chance to do something on the 23rd of anything I do it. My daughter was born on that date. That means I haven't smoked a cigarette for 23 years because I gave up as a present to her on her 5th birthday. On that date I signed my publishing contract and my house settled. It was No. 23 and it was good to Tom and me. So the 23rd was to be my departure day with my only commitment to be in Alice Springs for the Desert Choir five or six weeks later. Then came the good news that my Maggiolina Airlander had arrived from Italy. You don't know what a Maggiolina Airlander is? I am shocked. 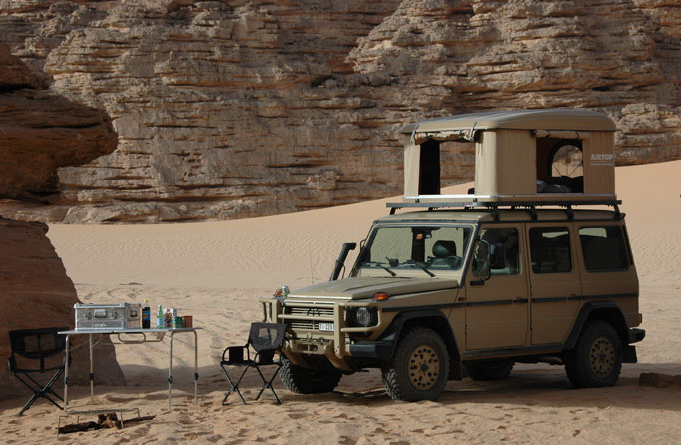 It is an aerodynamically designed roof top tent that will sit elegantly on my camper. The 23rd of May now becomes the day I drive to a little town of Allora in Queensland to have it fitted. Sleep is important to me. It can become a lifestyle at times. I write in bed, dream in bed and watch i-TV in bed. The Airlander was the final piece of the puzzle because I didn't want to sleep in the car or set up a tent. I am not as tough as John the Swagman who pulls up on the side the road with barely a mat to cushion with body. No. I will sleep in an all weather cube roof top cube situated under a tree so that birds, possums and me can become more acquainted over my stay. Where breeze from a river or ocean or desert can flow through and I can just lie there and feel it. As I get older, lonely sounds isolated by deep silence are becoming more and more exquisite. The official departure date for the Electronic Swagman and Tommie has become June 1. This allows me time to wander as I wish to Alice Springs for my choir and writer's trips. From there I will explore. I am already off on the road in my head. I am alone and amongst rocks in places I haven't seen yet. I am photographing with light that hits the water on some creek without a name and starting a fire by a river. I am also really scared. And when I get really really scared I remember a program on Radio National. A researcher had interviewed about 100 ninety year olds. They were all asked their greatest regret in life. Most said the same thing, that they wished they had taken more risks. At that stage of life they saw 'security' for the mirage it is. Meanwhile Tommie is trying to make sense of boxes and my spring cleaning. He recognises the different quality of the pack up. He isn't leaving my side until he knows he is part of the future. The future is what looms for me. A decade on the road I anticipate. It's worth waiting for my Italian Penthouse. Raymond - you are on the right track! We sleep in a Shippshape truck-top tent designed by Mr Shipp! We fall asleep by the light of the moon and stars, feel the night breezes and wake to the birds calling at eye level and the sun rising over the horizon. It's magic! We're above the crocigaters and bugs; the only downside (for a woman anyway) being the climb down to the loo... Have fun! Hi Maggie. I am looking forward to it. I am going to get beautiful linen and pillows and know that there is an oasis of slumber waiting for me each night. Yum. That's lovely. I saw a 60 year old man with a pony tail in Westpac the other day. I fought every instinct to cut it off and simply hand it to him and walk out Clint Eastward. Hi Clarissa. I am not really sure I am looking for anything and probably wouldn't know of I found it. Yaaah, Raymond! That looks like so much fun. I have been back in Qld for about a month and now have a job so, of course, the gypsy bugs are biting. Lol! You will have a great time. I agree, one is neither looking for something, but one is also looking for everything. Have a great time. Without getting all sixties on you, I am looking for 'nothing'. I want to bear witness to Australia. I discovered a long time ago that being in the Australian landscape is almost all I need. I have been overwhelmed by the connection at times. I am looking forward to writing about that as much as anything. Hi Cecilia. The program was a communication with older people about their lives. Their joys, wisdom and their regrets is amongst legitimate musings I would have thought. It was their reflections upon their lives from the vantage point of impending death so what I take from it is that, having assessed all the things like money etc, they came to their own conclusion that they wished they had taken more risks. It is something I have drawn some encouragement from in my life. 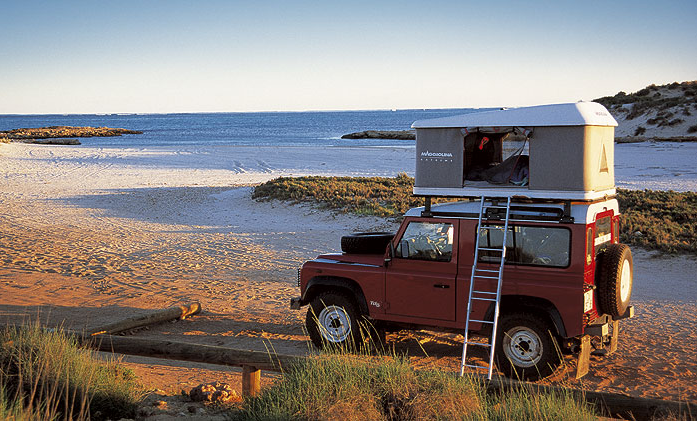 Love the rooftop camper, but need assurance it comes without the girl before I agree to have one. What are you scared about. You've got freedom and Tommy and mates and family. Different sort of security, but all there is in the end. Ask the Greeks. I have always thought if you have a good woodpile, and food store, life is OK. Biting me in the bum, this means no Thai holiday this year. We will be spending our time at Happy Farm digging and planting. We have already started moving in. Have fun, Raymond. Did you know that according to research you need to have at least 30 minutes of fun each day to prevent dementia? Now you tell me. Hey Rowena. Could you do a weekly agony aunt thing. People write to you as a psychologist. Things Like: Dear Rowena.... How many minutes of fun do you need a week to avoid dementia? Hi mate. Can't wait to see your new rig when it's finally all together. A bit scared is good, it keeps you on the edge. I'm wondering if they make an Italian penthouse for motorbikes? Hey Cisco. I saw a really small trailer being pulled by a motor bike last year. It opened into a tent and stove. Great. But it didnt have the splendour of mine. Hi Raymond - the outfit looks comfortable and all you need to go to sleep and wake up safe. Being scared and doing it anyway is a great way to live: I'm glad you included that piece from Radio National because I think we all need reminders like that, that risks are the things that make life so much more lively. Hope the writers behave and the choir sings up a storm. Hi Raymond I want to go too. I agree - take more risks and that always means being a bit scared. Maybe I will bump into you with my dogs in my truck some time! Mine is still only an imaginary truck! How exciting! Woof to Tommie!